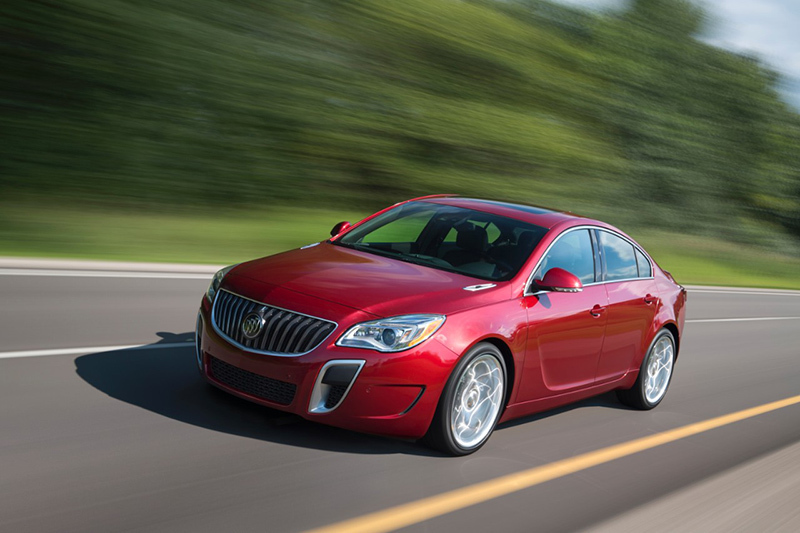 The Buick Regal – a previous recipient of Kelley Blue Book’s Brand Image Awards –adds new technologies for 2015, offering customers greater connectivity that complements lifestyles that are more connected than ever. They include OnStar with 4G LTE with and standard built-in Wi-Fi hotspot, as well as IntelliLink with Text Messaging Alerts and Siri Eyes Free. The new features build on the vehicle-wide enhancements introduced in 2014, making the European-bred midsize sedan a smarter choice for customers seeking technology-infused performance matched with the brand’s signature luxury and refinement. Additionally, radar- and camera-based safety features – including rear cross traffic alert, lane change alert, side blind zone alert, lane departure warning, forward collision alert and collision mitigation braking – are available. Adaptive cruise control is also offered. It senses traffic in front of the Regal to adjust vehicle speed, including stopping the vehicle in heavy traffic and accelerating again. An advanced Haldex all-wheel-drive system is also available with the 2.0L turbo engine, giving Regal drivers the most of traction in all driving conditions – and enhancing the cornering capability of the Regal GS when driven in the GS mode of the Interactive Drive Control System. Available LED daytime running lamps form a distinctive wing profile above the headlamps, designed to give the Regal an unmistakable signature on the road, and at the rear, LED wing-shape taillamps give the car a familial look. 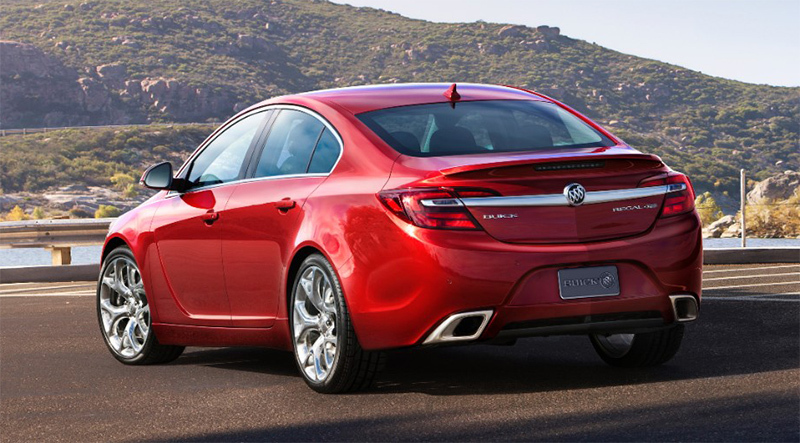 A chrome accent bridges the taillamps to further enhance Regal’s wide stance. GS models are distinguished by unique front and rear fascias, exclusive 19-inch wheels (20-inch wheels available) and a lowered ride height. 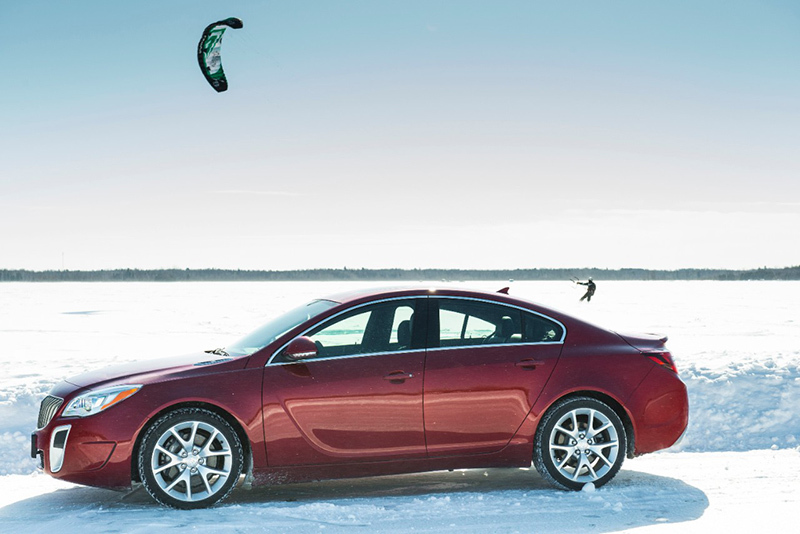 Seventeen-inch and 18-inch wheels are offered on all other Regal models. Ten exterior color choices are offered (six offered on GS): Dark Sapphire Blue Metallic (new for 2015), Copper Red Metallic, Quicksilver Metallic, Summit White, Black Onyx, Crystal Red Tintcoat, White Diamond Tricoat, Smoky Gray Metallic, Champagne Silver Metallic and Black Diamond Tricoat. Later in the year, Dark Chocolate Metallic and Emerald Green Metallic will be offered on a special, limited basis. 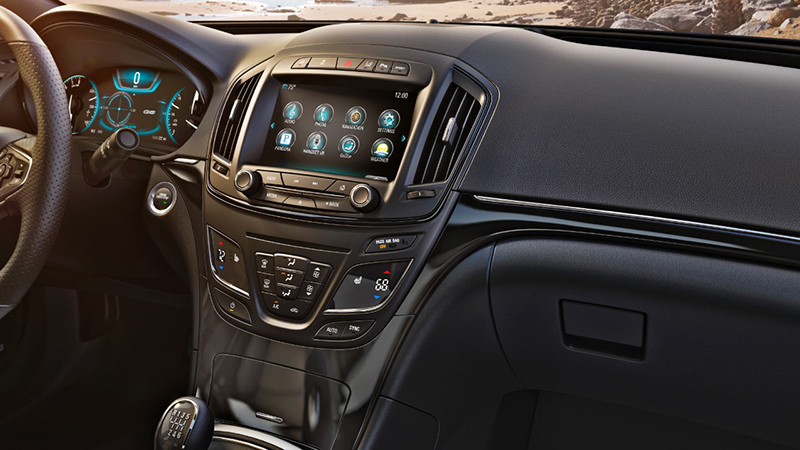 The 2015 Regal’s interior blends sculptural beauty and refinement with technology, centered on Buick’s next-generation IntelliLink infotainment system. The instrument panel “center stack” houses the system’s eight-inch color touch screen. It is designed for easy operation with intuitive controls and smartphone-influenced swipe recognition for easier navigation. The center stack is also home to the dual-zone climate controls which, like the IntelliLink screen, feature capacitive-touch operation – and are framed in chrome. A high-resolution, 4.2-inch color display is the focal point of the instrument cluster, delivering vehicle information, navigation, audio system functions, phone features and more. In Regal GS, an eight-inch configurable color instrument cluster screen is standard. It allows the driver to customize the displayed information with adjustments via steering wheel controls. This premium instrument display is framed with chrome accents and delivers chronograph-style graphics in two modes: Touring and Sport. It is also complemented with a pair of semicircle mechanical instruments for the tachometer and other vehicle functions, befitting of the GS’s driver-oriented mission. Standard power windows with driver/front passenger express up/down and rear-passenger express down. Regal’s standard IntelliLink system gives customers the best of both worlds when it comes to infotainment. It provides easy, intuitive operation of basic functions, yet it is also highly customizable and capable of linking up to 10 devices such as smartphones, SD cards and MP3 players, giving users more ways of staying connected. The IntelliLink system’s eight-inch-diagonal color touch screen also serves as the display for the standard rearview camera system and available navigation system, as well as the controller for Regal’s audio system. Complementing IntelliLink to enhance Regal’s connectivity is new OnStar with 4G LTE and standard built-in Wi-Fi hotspot. It provides a mobile hub for drivers and passengers to stay connected. The hotspot is on whenever the vehicle is on and comes with a three-month/three-gigabyte data trial, after which customers can purchase additional data. Regals is equipped with a choice of two efficient engines: the standard 2.0L turbo four-cylinder engine rated at 259 horsepower (193 kW) and a 2.4L four-cylinder engine witheAssist light electrification technology, rated at 182 horsepower (136 kW)). The eAssist powertrain uses a lithium-ion battery system and electric motor-generator to enable regenerative braking capability. Instead of providing all-electric propulsion, the system provides power assistance to the internal combustion engine. The eAssist system also allows the engine to shut down fuel delivery in certain deceleration situations, or at a stop, which saves additional fuel. Regal witheAssist is EPA-rated at 25 mpg in the city and 36 mpg on the highway. The standard 2.0L engine’s turbocharger features a twin-scroll design that uses exhaust tuning to generate balance between maximum power and excellent turbo response, enabling the engine to deliver a broad torque band. In fact, it delivers 90 percent (260 lb-ft / 353 Nm) of its peak torque from 1,700 rpm to 5,500 rpm and a full 295 lb-ft of peak torque (400 Nm) from 3,000 to 4,000 rpm in the Regal. For the Regal GS, peak torque is reached at 2,500 rpm and is maintained through 4,000 rpm. Those broad torque bands are supported by boost levels as high as 24 psi (1.65 bar) in the speed range, engineered to give the Regal and Regal GS assuring, exhilarating feelings of immediate power on demand. Six-speed automatic transmissions are matched with the engines. GS customers have the choice of a six-speed manual, as well, at no additional cost – making it one of the few vehicles in the segment to offer a turbocharged engine with manual transmission. The Regal’s chassis and structural systems were developed globally, enabling the handling and dynamics of a luxury import sport sedan with the quiet, refined ride expected of a Buick. All models feature four-wheel disc brakes, with 11.7-inch front rotors on 2.4L-equipped models; 12.6-inch front rotors on Regal with the 2.0L turbo engine and 13.6-inch front rotors with Brembo aluminum calipers on GS. The Regal’s Haldex all-wheel-drive system (available with the 2.0L turbo engine) is designed to make the most of handling and stability in all driving conditions. It is an advanced, fully automatic and on-demand system that includes developments in wheel-slip management and an electronic limited-slip rear differential. While engineered to offer sure-footed handling in low-grip conditions, Regal’s AWD system also alters its characteristics to support performance-oriented driving when the Sport or GS driving modes are selected on Regal GS. It also contributes to a quieter and smoother ride with minimal torque transferred to the rear wheels when all-wheel-drive traction isn’t required. The Regal GS is designed to deliver a dynamic driving experience through sophisticated suspension technologies, premium amenities and a more expressive presence. Along with its standard turbocharged powertrain, the GS features the exclusive application of Buick’s Interactive Drive Control system, which allows the driver to select different drive modes – including the GS mode and its track-oriented competitive setting. In GS mode, the Regal increases steering efforts for more direct feedback to the driver. Increased damping levels ensure ultimate wheel control and reduced body roll for better agility. GS mode also is designed to alter the shift feel of the six-speed automatic transmission. The GS’s HiPer Strut front suspension enhances ride and handling by reducing torque steer; more linear and communicative steering through improved camber control; and improved impact isolation on bumps and rough surfaces. It is complemented by a four-wheel-disc brake system featuring front Brembo four-piston front calipers and larger rotors. A four-link independent rear suspension is used on FWD models and an H-arm rear suspension is used on AWD models. It uses the same attachment points as the four-link system, but with the cross member attached via isolated mounts. This system delivers excellent ride quality and handling, while minimizing road noise. The GS’s front and rear dampers incorporate active Computer Damping Control, continuously changing damper characteristics that optimize ride comfort and handling capabilities over varying road surfaces and profiles. More aggressive, performance-oriented damping characteristics can also be selected by the driver through the Interactive Driver Control system. Additionally, the Regal GS features a lowered ride height and 19-inch aluminum wheels to project a sporty, purposeful stance. Twenty-inch wheels with summer-rated performance tires are available. Unique front and rear fascias distinguish the GS. The front fascia incorporates prominent, vertical air intake slots. The rear fascia features a pair of integrated, satin-metallic trapezoidal exhaust outlets. Rocker panel extensions and a rear spoiler extension are also part of the package. Driver Confidence 2 package adds collision preparation (with collision mitigation braking) and full-speed-range adaptive cruise control that conveniently works in stop-and-go traffic. The collision mitigation braking feature can intervene in certain crash-imminent situations, automatically triggering emergency braking if the driver fails to respond to a previous alert. With lane change alert, the driver is alerted to vehicles in the blind sport during a lane-change or merging maneuver. Regal’s standard safety features also include six standard air bags, with rear-seat thorax air bags bringing on Premium II and GS models, for a total of eight, as well as a rear-vision camera, StabiliTrak, traction control and four-wheel disc brakes with ABS and intelligent brake assist. Front and rear park assist is standard on GS.